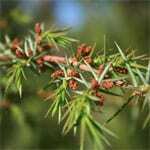 Although it has prickly leaves, the new shoots provide tasty food for red deer and rabbits. Although it is not endangered worldwide, it is becoming rare in Ireland because of a combination of overgrazing and changing climate. Juniper provides wonderfully dense cover for nesting birds, e.g. 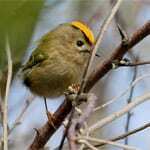 goldcrests and song thrushes. Its fruits are eaten by fieldfares who come to Ireland in winter and help to distribute the seeds. A lot of insects will eat its seeds as well. 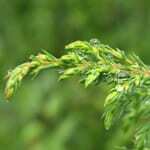 Juniper has evergreen, prickly, small, blue-green needles with a central white stripe, stiff, arranged in clusters of three. It slightly resembles gorse in its appearance, especially by its bushiness but unlike gorse it does not regenerate readily after fires. Male flowers are small and yellow. Female flowers are greenish and appear from May to June. Male and female flowers are borne on separate plants. The flowers are wind-pollinated. 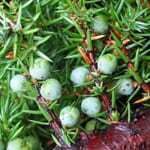 Juniper fruits are cones made of fleshy scales and look like berries. They are green the first year and become blue or purple-black when ripe the second year. Every fruit usually bears around 3 hard, triangular seeds. The bark is reddish-brown. It shreds and peels in strips. 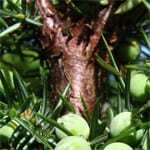 Juniper is slow-growing and long-lived. Plants can live up to 2000 years. It grows on dry, rocky hillsides, chalk downs, heath and moors, preferably rich in lime. Although it can take on different forms, in Northern Ireland it grows mainly on exposed slopes and is usually prostrate (lying close to the ground) and rarely taller than 3 metres. 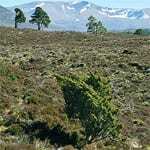 It likes sunny open spaces and usually creates montane scrub vegetation.